Today's post is a little random and normally I wouldn't dedicate a whole post to a small pot of nail polish remover but I have been so impressed with it that I wanted to share it with you all. 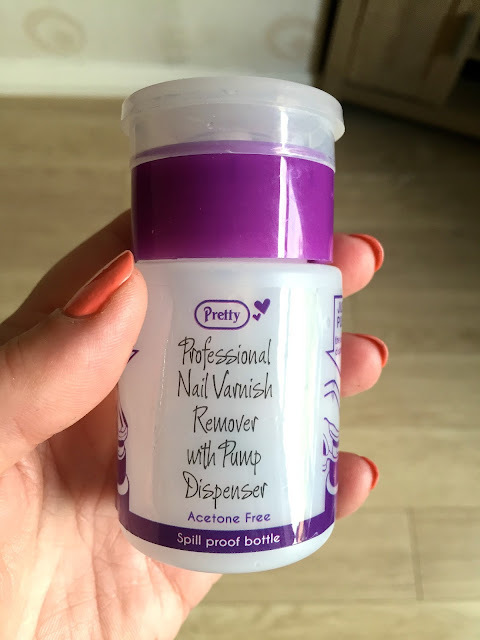 I bought the Pretty Professional Nail Polish Remover back in the summer from a Bodycare store in Manchester Arndale and paid 99p for it and I have to say it is absolutely fantastic, it removes nail polish effortlessly and the pump dispenser is brilliant, I will definitely be purchasing more it really is a fantastic product. 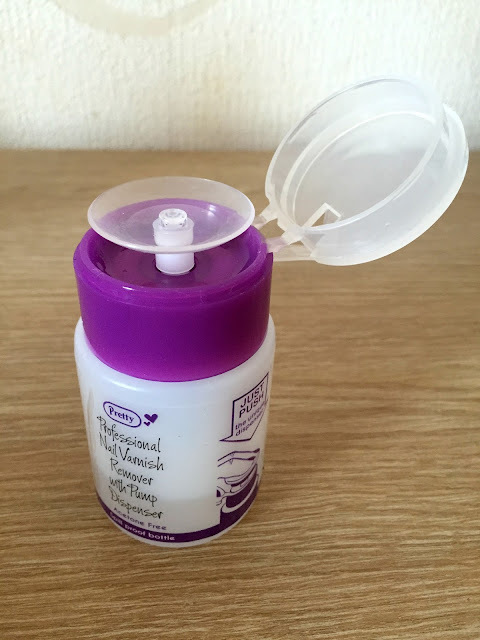 I bought the acetone free polish remover as acetone free polish remover is a lot kinder on the nails than an acetone polish remover but if you prefer acetone it is available, the packaging is pink on the acetone remover and as you can see purple on the acetone free. The polish remover is so easy to use, the lid is a flip lid and then I press down a cotton pad on top of the dispenser and the nail polish remover is dispensed onto the cotton pad, I did wonder if the product would be good because of the price but it really is and removes glitter polishes with ease, and the spill proof bottle is brilliant. I am honestly so impressed with it I had to share it with you, this is too good to keep to myself! 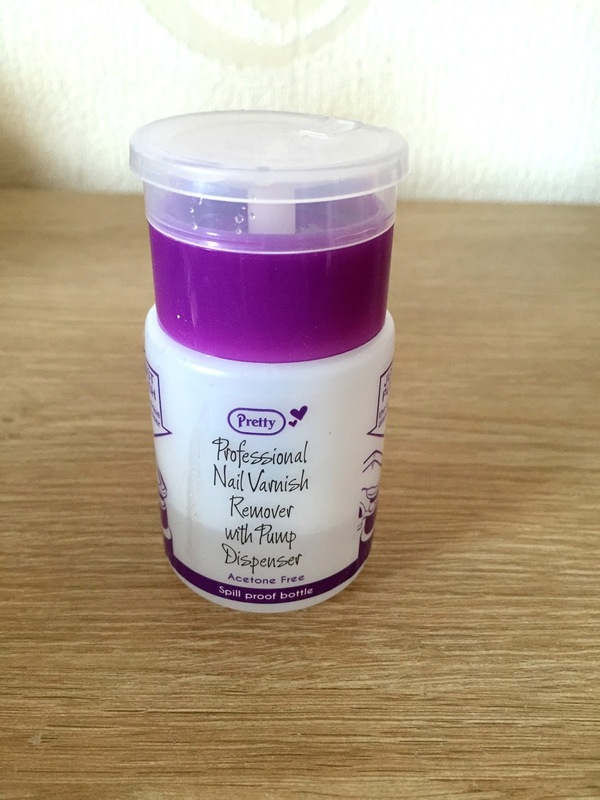 I purchased my nail polish remover from Bodycare as I said but I have found the Pretty Nail Polish removers on eBay here for £2.49 including delivery, it is available in both acetone and acetone free, I do feel that is quite expensive for 70ml of product so if you don't want to pay £2.49 for the Pretty Nail Polish remover I also found 2 pump dispensers from eBay for £3.99 here including free delivery so you could share one with a friend or relative or keep both yourself and refill as often as you like with your favourite polish remover if you don't have a Bodycare store where you live or if you want a cheaper alternative to the Pretty Nail Polish remover. I hope you've enjoyed my rather random post, I felt I had to share with you this great little product, I'm so impressed with it and think you would be too, you could also buy one as a stocking filler for someone as a Christmas gift for any nail lover or treat yourself too. Have you tried the Pretty Nail Polish remover?